I am not sure what it is about boys and sticks but they sure seem to inspire a lot of joy! 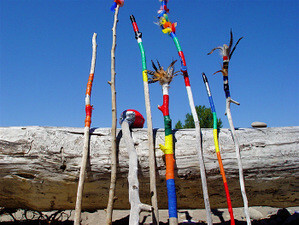 Another fun find is any sort of feather- this craft merges the two- using sticks and feather to create a colourful walking stick. We use a lot of colored electrical tape hear for tons of crafts so this all ready has my kids stamp of approval. here are complete instruction on Full Circle website.